UN Special Envoy for Syria, Staffan De Mistura, acknowledged in an interview with Sputnik that intra-Syrian talks to end the Syrian crisis are progressing. There are several rebel groups in Syria fighting against President Assad while the emergence of the Islamic State and other extremist groups, including groups loyal to al-Qaeda, has complicated the crisis. To simplify the intricate situation, the Special Envoy called for pooling efforts against the Islamic State group, conquering back Raqqa and ending the siege on Deir ez-Zor. 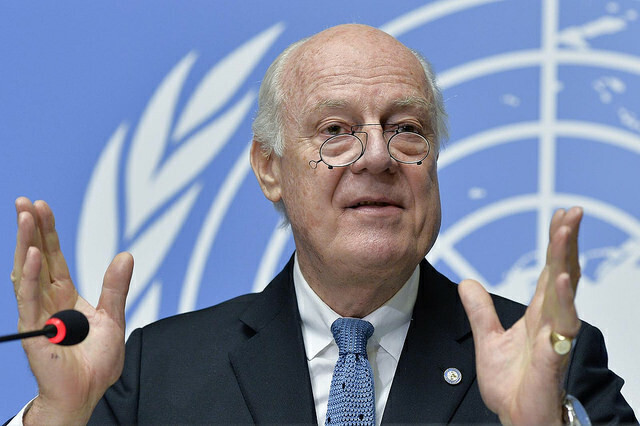 Mistura admitted that “the only way” to end the war is “through the political process”, which would become effective when the different rebel groups have a common ground. Helping the rebel groups to “have commonalities among them” has been encouraging and some of their positions are said to be similar to that of Damascus such as the protection of Syria’s sovereignty, unity, integrity and institutions. Meanwhile, a Syrian delegation is in Geneva to meet with Mistura within the scope of the seventh round of the intra-Syrian dialogue. An agreement to de-escalate in certain zones was reached last week between Jordan, Russia and the USA. It is intended to be replicated to other parts of the country if it is successful. Written by: Peter Mulvany on July 11, 2017. Posted by Peter Mulvany on Jul 11 2017. Filed under Headlines, World News. You can follow any responses to this entry through the RSS 2.0. Both comments and pings are currently closed.